You won't find too many JAGs like Col. Eugene Ingrao. The first thing you notice about the New Jersey Army National Guard's full-time attorney is the Combat Action Badge and Airborne Jumpmaster badges on his uniform. He's got the steely eyes of someone who's deployed with Special Operations forces. That's because he has. Dig a little deeper and another distinction emerges: Ingrao is the first Judge Advocate General Corps officer in the history of the New Jersey Guard to command a battalion. 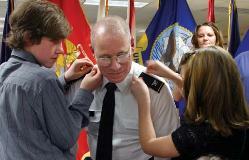 Col. Eugene Ingrao's children Gene Jr., left, and Jenna, right, pin on colonel's epaulets while his sister-in-law Jennifer Harcer, back, watches during his promotion ceremony at Joint Forces Headquarters - New Jersey on March 6. U.S. Army photo by Sgt. Raymond Reyes, 444MPAD. But the bottom line is that Tabernacle resident loves being a military lawyer. "Every day when I come to work, there is a different and exciting issue that I get to learn about being a JAG officer," Ingrao says. His enthusiasm, dedication and willingness to put himself in harm's way to do his job played a big role in the 46-year-old lawyer's most recent distinction, becoming one of the few full-time New Jersey Army Guard JAG officers ever to be promoted to full colonel. On the drill floor surrounded by his family – many of whom traveled from Michigan -- Ingrao credited his mentors, peers and legal team for giving him the support that allowed him to rise as the top attorney for the state's Army and Air Guard. Ingrao, a graduate of the Wayne State University School of Law in Detroit, joined the New Jersey Army National Guard in 1999 and said one of the highlights of his career was the opportunity to serve in Afghanistan with the Green Berets. The chance came when he volunteered for service in 2004 as a legal officer with the 3rd Special Operation Group during Operation Enduring Freedom in Afghanistan. His time with the special operations troops helped him earn the coveted Combat Master Jumpmaster Wings with a Combat Star. "I will always be grateful for the New Jersey command, particularly (Maj. Gen. Glenn) Rieth, for providing me the opportunity to deploy with 3rd Group and to provide the latitude to learn how to become a well rounded officer," Ingrao said. Ingrao's loves the fact that no two days as a JAG are the same. One day, he might provide legal counsel for commanders on a Uniform Code of Military Justice matter. The next day, he might give advice about environmental law to officials who are facing an issue at an armory. "When I visit my civilian lawyer friends," Ingrao said. "They usually want to know how my day went because they believe my job is more interesting." The resident's faces lit up as the sound of voices singing Holiday carols could be heard in the halls of the Vineland Veterans' Memorial Home on Dec. 15. Nineteen Airmen from the 177th Fighter Wing and the 108th Wing were joined by 71 fourth graders from the Seaview School in Linwood for the ninth Annual Holiday "Songfest" at the Home. Upon arrival, Airmen and fourth graders were issued candy canes and holiday greeting cards, assigned to groups and sent out to spread cheer to the residents. According to one of the residents, despite the challenge of being accompanied by the Airmen, the students performed admirably. Master Sgt. 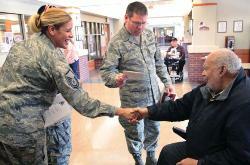 Liz Stefanoni, left, 108th Wing, and Senior Master Sgt. Paul Thompson, center, Joint Forces Headquarters-New Jersey (Air), greet Vineland Veteran's Home resident Curtis Washington.